"Asian Cup" redirects here. For other uses, see Asia Cup (disambiguation). The AFC Asian Cup is an international association football tournament run by the Asian Football Confederation (AFC). It is the second oldest continental football championship in the world after Copa América. The winning team becomes the champion of Asia and until 2015 qualified for the FIFA Confederations Cup. The Asian Cup was held once every four years from the 1956 edition in Hong Kong until the 2004 tournament in China. However, since the Summer Olympic Games and the European Football Championship were also scheduled in the same year as the Asian Cup, the AFC decided to move their championship to a less crowded cycle. After 2004, the tournament was next held in 2007 when it was co-hosted by four nations: Indonesia, Malaysia, Thailand and Vietnam. Thereafter, it has been held every four years. The Asian Cup has generally been dominated by a small number of top teams. Initially successful teams included South Korea (twice) and Iran (three times). Since 1984, Japan (four times) and Saudi Arabia (three times) have been the most successful teams, together winning 7 of the last 10 finals. The other teams which have achieved success are Qatar (2019 current champions), Australia (2015), Iraq (2007) and Kuwait (1980). Israel won in 1964 but were later expelled and have since joined UEFA. Australia joined the Asian confederation in 2007 and hosted the Asian Cup finals in 2015. The 2019 tournament had been expanded from 16 teams to 24 teams, with the qualifying process doubling as part of the qualification for the 2018 FIFA World Cup. Unlike other confederation tournaments, the Asian Cup has often been rescheduled to another time of year to better suit the climate of the host nation, for example in 2007 it was played in July but the following three tournaments were played in January. Two years after the Asian Football Confederation (AFC) came into being in 1954, the first ever AFC Asian Cup was staged in Hong Kong with seven of the 12 founding members taking part. The qualifying process involved the hosts plus the winners of the various zones (central, eastern and western). It was only a four-team tournament, a format that also existed for 1960 and 1964. Each sub-confederation already hosts their own biennial championship, each with varying degrees of interest. Dominance has swung between the East and West so far. From the superiority of South Korea in the early years of the competition, the tournament became the preserve of Iran who won three consecutive tournaments in 1968, 1972 and 1976. West Asian countries dominated in the 1980s with Kuwait becoming the first Middle East country to win the championship in 1980, followed by Saudi Arabia's consecutive wins in 1984 and 1988. Japan hold the record for the most victories in the tournament's history, having won in 1992, 2000, 2004 and 2011. The 2007 Asian Cup also saw Australia compete for the first time, reaching the quarter-final stage; Iraq defeated Australia, South Korea and Saudi Arabia to win their first ever Asian Cup despite an adverse domestic situation and conditions for the players. At the 2019 Asian Cup, the video assistant referees were used in the tournament for the first time, as well as an expansion to 24 teams. In addition, a fourth substitution was allowed during extra time. Current trophy, carried by Park Ji-sung. There have been two Asian Cup trophies; the first one used between 1956 and 2015, and the second one in use since 2019. The first trophy came in a form of a bowl with circular base. Its was 42 centimeters tall and weighs 15 kilograms. Until the 2000 tournament, the black base contained plaques engraved with names of every winning country, as well as the edition won. The trophy was redesigned, adding more silver and reduce the black base to just a thin layer down. This base was plaque-free and the winner names were engraved around the base. During the draw for the 2019 group stage on 4 May 2018 at the Burj Khalifa in Dubai, an all new trophy made by Thomas Lyte was unveiled. It is 78 centimeters tall, 42 centimeters wide, and weighs 15 kilograms of silver. The trophy is modeled over lotus flower, a symbolically important aquatic Asian plant. Five petals of the lotus symbolize the five sub-confederations under the AFC. The winner names are engraved around the trophy base, which is separable from the trophy's main body. This trophy has a handle on each side, unlike its predecessor. Since 2019, the final tournament is played in two stages: the group stage and the knockout stage. In the group stage each team plays three games in a group of four, with the winners and runners-up from each group advancing to the knockout stage along with the four best third-placed teams. In the knockout stage the sixteen teams compete in a single-elimination tournament, beginning with the round of 16 and ending with the final match of the tournament. 1 Israel was expelled from the AFC in the early 1970s and eventually became a member of UEFA. Despite being the second oldest continental football tournament, the AFC Asian Cup has suffered numerous criticisms. Criticisms over the inability of the AFC Asian Cup to attract large attendances, political interferences, high costs of traveling between AFC member states and different cultures were highlighted over the Asian Cup. The AFC Asian Cup is marked with numerous political interferences. This was the case of Israel, as the team used to be a member of the AFC but following Yom Kippur War and increasing tensions against the Arab AFC members, Israel was expelled from the AFC in 1974 and had to compete in OFC until being granted UEFA membership in 1990. Meanwhile, similar cases also exist in other AFC tournaments like the case between Saudi Arabia and Iran. Following the 2016 attack on the Saudi diplomatic missions in Iran, Saudi Arabia has rejected playing with Iran and even threatens to withdraw if the AFC refuses to follow, and even extended it to international level; or tensions between the two Koreas during the 2010 FIFA World Cup qualification had led North Korea to withdraw from hosting the South Korean team and refusing to display the South Korean flag and play their national anthem. As a result, North Korea's home matches were moved to Shanghai. Low crowds have also been another problems for the AFC Asian Cup. At the 2011 AFC Asian Cup, there had been concerns over low record of crowds due to little football interests and high costs of traveling between Asian nations leading to then-Australia coach Holger Osieck claimed that the Qatar Armed Forces were used to fill up the stadiums simply for aesthetics, while Australia international Brett Holman commented, "Worldwide it's not recognised as a good tournament". ^ "FIFA Council votes for the introduction of a revamped FIFA Club World Cup". FIFA.com. 15 March 2019. Retrieved 15 March 2019. ^ "Australia play for the first time". Asiancup.com.au. Retrieved 2015-05-03. ^ "Revamp of AFC competitions". The-afc.com. 25 January 2014. Archived from the original on 3 February 2014. ^ "AFC Asian Cup changes set for 2019". Afcasiancup.com. 26 January 2014. Archived from the original on 30 January 2014. ^ "Asian Cup: Know Your History - Part One (1956-1988)". Goal.com. 2011-01-07. Retrieved 2015-05-06. ^ "Asian Cup: Know Your History - Part Two (1992-2007)". Goal.com. 2011-01-07. Retrieved 2015-05-06. ^ Lampen, Jerry. "Iraq ride wave of support to lift Asian Cup". Reuters. Retrieved 13 September 2014. ^ "AFC plans to introduce VAR at UAE 2019". 27 September 2018. ^ "The Asian Cup Trophy - Asia Cup". Getty Images. 21 December 1996. 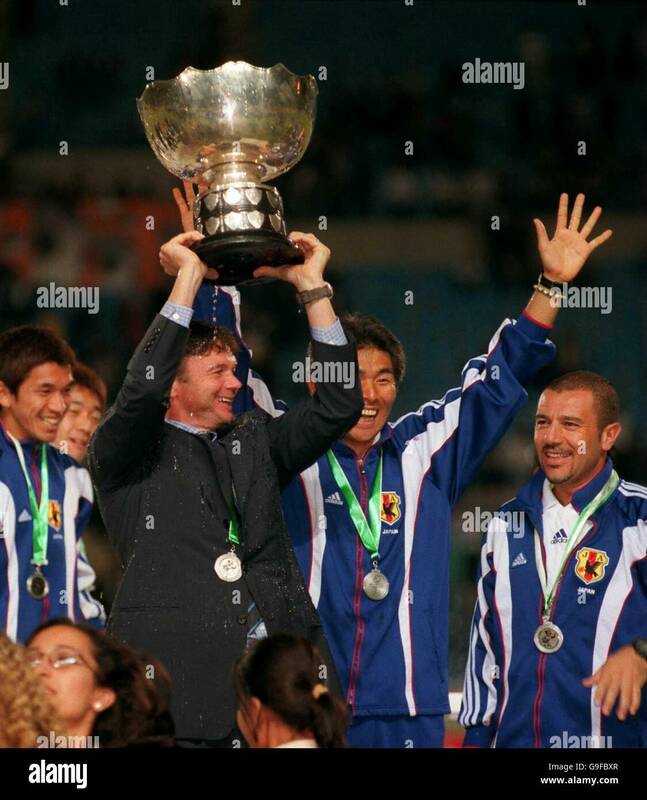 ^ "Japan coach Philippe Troussier lifts the Asian Cup trophy". Alamy. 29 October 2000. ^ "The remarkable rise of Asia's greatest showpiece". Asian Football Confederation. 5 December 2018. Archived from the original on 5 February 2019. ^ "About the IFA". The Israel Football Association. Archived from the original on 2 May 2008. Retrieved 27 July 2014. ^ "Iran's success reflects the failures of Asian football". The Economist. 14 June 2017. Retrieved 21 January 2019. ^ Panja, Tariq (17 January 2019). "Politics Looms Over Empty Seats as Saudi Arabia Faces Qatar in Asian Cup". The New York Times. Retrieved 21 January 2019. ^ a b Paraskevas, Chris. "Asian Cup 2011 Comment: Empty Stadiums Hurting Asian Football And Qatar". www.goal.com. Retrieved 21 January 2019. ^ Conor Heffernan (20 November 2014). "The Controversial Case of Israel & International Football". punditarena.com. Pundit Arena. Retrieved 29 July 2018. ^ "Saudi-Iranian Tension Extends To Sports – Saudi Arabian Football Federation Announces: We Will Not Play In Iran". memri.org. The Middle East Media Research Institute. 6 January 2016. Retrieved 29 July 2018. ^ Mark Ledsom (7 March 2008). "Koreas match moved to Shanghai after anthem row". Reuters. Retrieved 29 July 2018. Wikimedia Commons has media related to AFC Asian Cup.